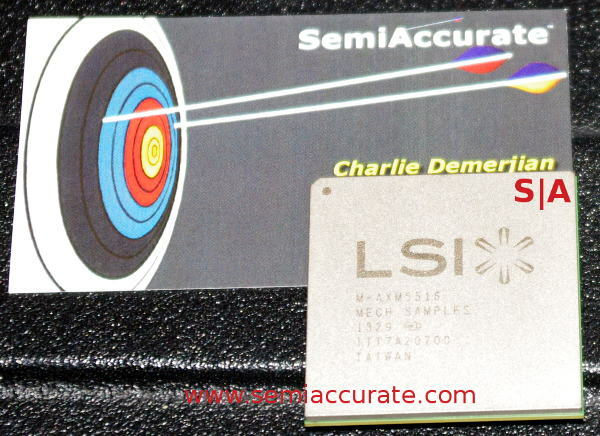 That 16-core A15 Axxia communications chip LSI keeps talking about is finally here and SemiAccurate got their hands on one. Not only that but LSI was showing them running in real systems on the ARM Techcon show floor. The chip below was real silicon, I know it says Mech Sample but given how much these things cost you can hardly blame LSI for putting non-working ones on the show floor. That said the Axxia 5516 was running demo code in another booth. The device itself is pretty tame looking, mainly just a lidded SoC that looks like this.